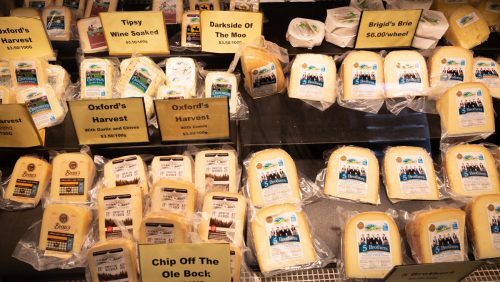 You are at Home Food Adventures I guarantee a GRATE time when you visit Oxford County’s Big Cheese Days! I guarantee a GRATE time when you visit Oxford County’s Big Cheese Days! 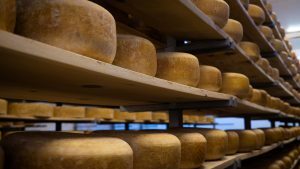 When you think of a place in the world with tons of amazing locally produced cheese, you might think Switzerland, Germany or even France. 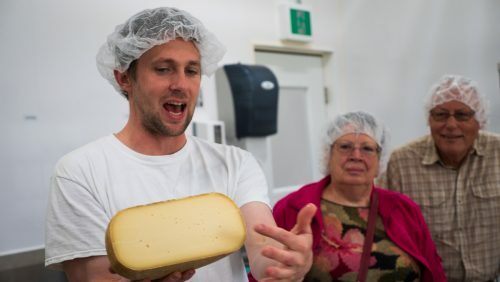 But cheese lovers, put away that passport because I am going to tell you about a place that is like the Willy Wonka of cheese and best part, it is in Ontario. 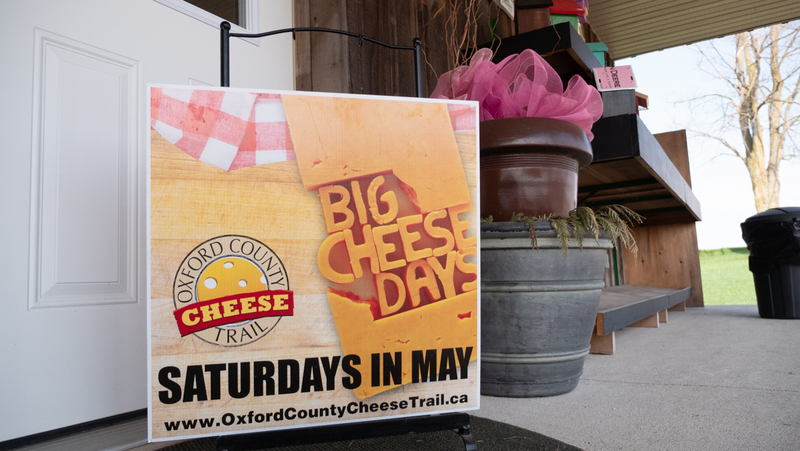 That’s right folks, Oxford County is known for their amazing cheeses and culinary tourism. 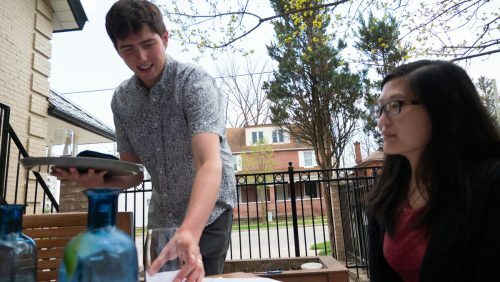 It is only about an hour and a half away from downtown Toronto which is perfect for a weekend getaway. You must think this is too good to be true, trust me, I thought so too until I visited (not once but twice to enjoy all the cheesy goodness). The first time I visited, I was hooked. 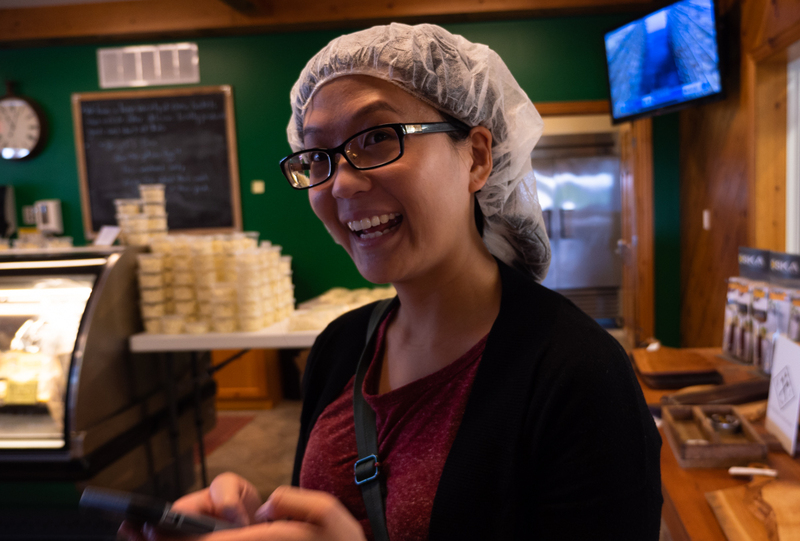 The cheese makers are so dedicated in making high quality cheeses and you can see their passion in their eyes when they speak about their products! I love food (obviously!) and I really appreciate when other people appreciate and enjoy talking about food as much as I do. You can read more about my first Oxford County experience here. This time I went back to experience their Big Cheese Days. 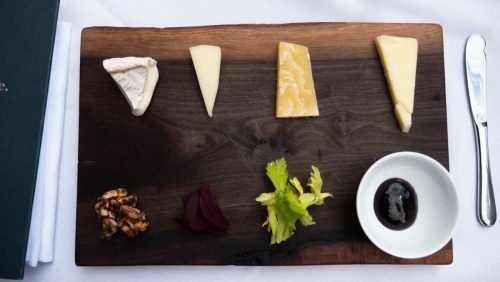 Every Saturday in May, different pubs, restaurants, cheese makers and pretty much all different establishments feature cheese or dairy items. Think of their regular cheese trail but times a million! They really step up their cheese game during the month of May! 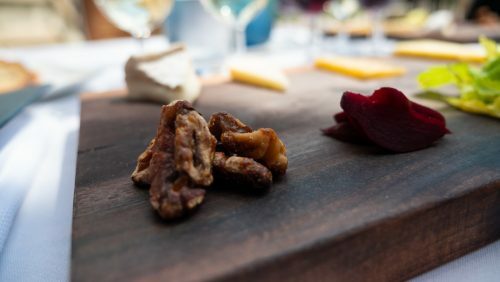 This culinary adventure is so unique and if you are a foodie like me, you really need to book a weekend getaway to Oxford County. Every time I visit, I experience something completely different and the trips are always so fun and memorable. If you have a chance to go, I would recommend booking a weekend in Oxford County since there are so many different stops. You can check out so many places by staying the whole weekend. Okay, so back to Big Cheese Days, there are 28 stops and here are the highlights from my visit! First thing first, I hit up Leaping Deer Adventure Farm. They sell amazing homemade comfort foods that you can either bring home with you or dine in. They had a special Big Cheese Days menu but we really wanted to pick up some apple pie bread again! Yes friends, this freshly baked loaf of bread has apple pie filling inside. Does life get any better than this? If you do want to try the bread, make sure you go early. It is quite popular and they sell out daily (and early)! Second stop, one of my favourite cheese makers in Ontario – Gunn’s Hill Artisan Cheese. 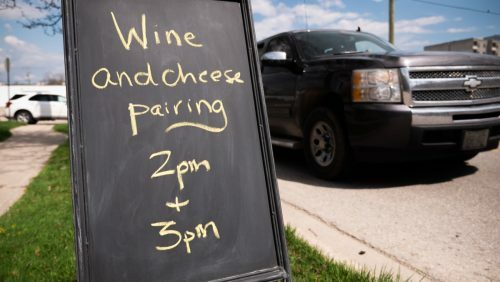 During Big Cheese Days, Gunn’s Hill offers cheese tasting events. Many people call themselves cheese makers but Shep – the owner and cheese maker of Gunn’s Hill is the real deal. When he talks about his cheese and the inspiration behind his creations, he has a huge smile stretching ear to ear and his eyes lights up. You can see and hear the passion and it shows in the results of the products. 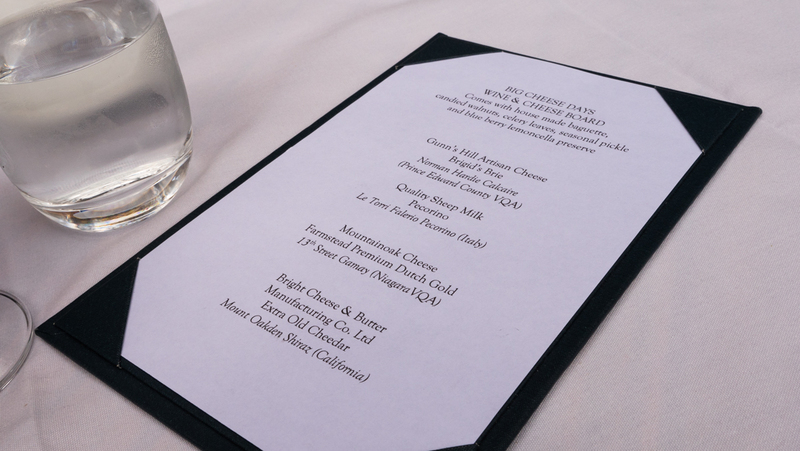 During our tasting, we tried Gunn’s Hill’s famous 5 Brothers cheese (yes, Shep is one of the 5 brothers). We tried the cheese during different stages of aging. It was so neat to taste and see all the differences. Some differences were subtle and some differences were very pronounced. Shep was so knowledgeable and answered all of our questions! 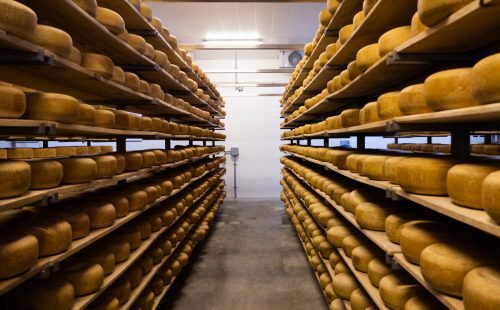 From how the holes in Swiss cheese are created to if we can eat cheese rind! (If you are wondering, the holes are created by a desirable bacteria that releases carbon dioxide and eats away the lactic acids creating those perfect round holes. 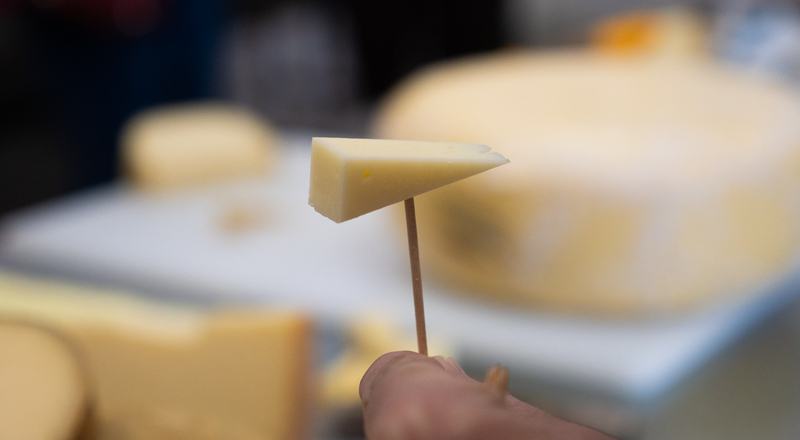 And yes, you can eat the cheese rind or add it to your sauces to enhance flavours!) Gunn’s Hill is a must go if you are visiting Oxford County! 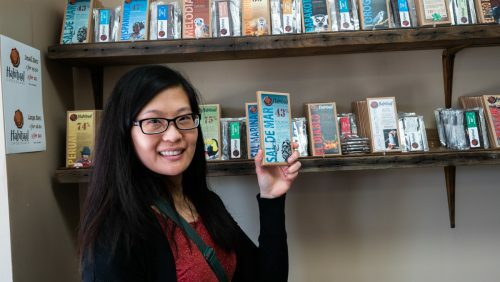 Next, we venture into Habitual Chocolate (if you are wondering why a chocolate shop is on the cheese trail it is because they use local dairy products in their coffees, teas and hot chocolates!) 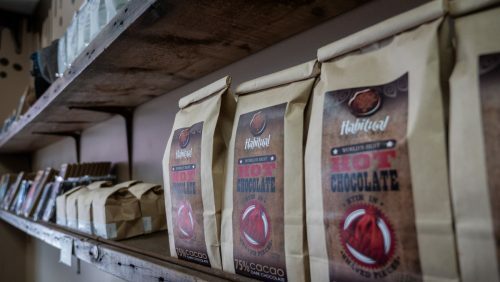 The aroma of cocoa beans engulfs your nose as you step into this quaint boutique. Here you can get the best and highest quality of chocolates. Everything is organic and made with the finest ingredients. You can grab your favourite multi or single origin chocolate from 43% to 100% cocoa content. I have never tasted a 100% before and I loved it! 100% cocoa content essentially means that there are no sugars added to it. The lower the percentage, the more sugar is added. The 100% was 100% in my books! I loved the rich and slightly bitter flavours. I thought it would be a lot bitterer but in my opinion, it was perfect. It would be perfect to bake with so your baked goods wouldn’t have an excess amount of sugar. I also tried a variety of other percentages and really loved them all (they have a tasting bar, so I couldn’t resist trying a few). Another highlight was the mint chocolate. Most times when you buy mint chocolates, the mint is a simulated flavour and just tastes, well … fake. Not at Habitual, you can really taste the mint like you just pulled it out of your herb garden. It was so refreshing! The shop also sells other chocolate goodies like chocolate covered fruits and chocolate shavings for hot chocolate. And when the chocolatier Philippe Lehner is in, you can see his work of art in action. They have a chocolate making room that is all glass and you can see the magic happen! (I definitely have to come back and see it in action). 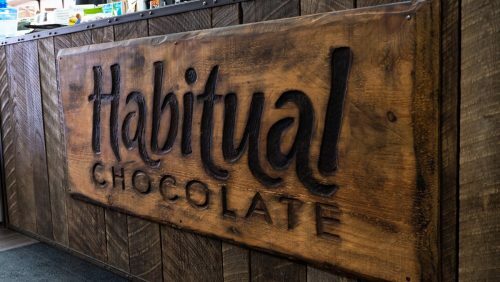 When you taste pure and real chocolate like the ones from Habitual, you can never go back to the grocery store version! 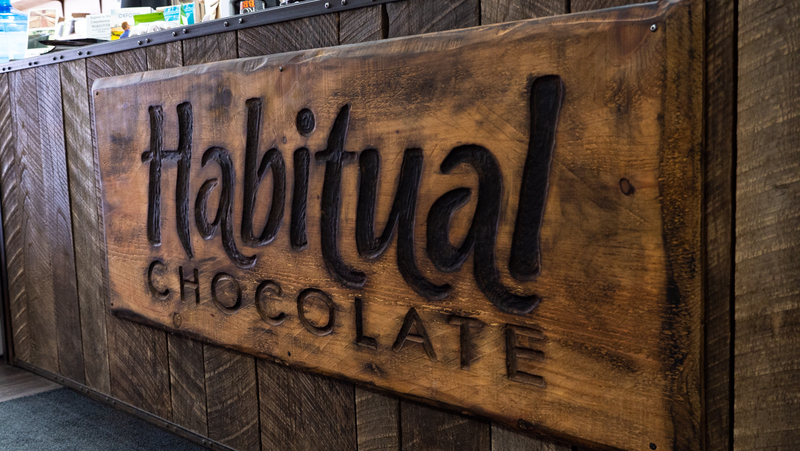 Make sure you add Habitual to your list if you are a chocolate lover like me. Our next stop was at the charming, family-run Charles Dickens Pub. For Big Cheese Days, they created a number of dishes that feature local cheese. I ordered the poutine made with Gunn’s Hill cheese curds. 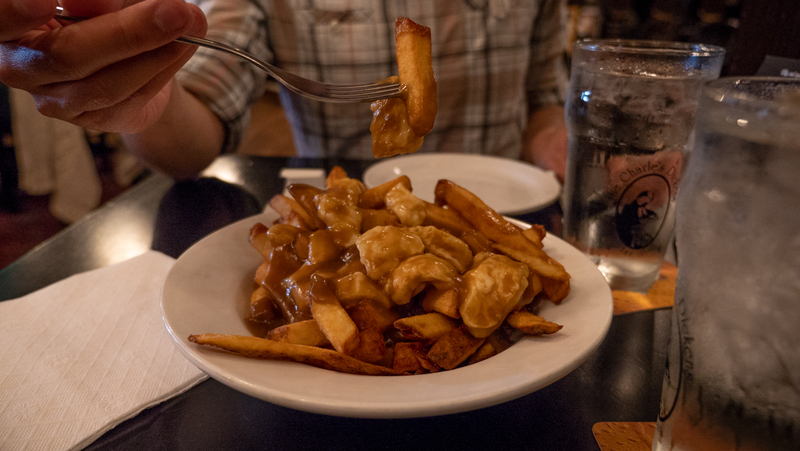 Warm gravy hitting squeaky cheese curds are always a winning combination in my books. 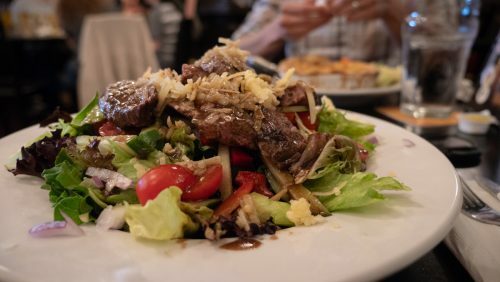 I also ordered the steak salad with Mountainoak cheese. The salad flavours were so balanced and it really hit the spot for a nice lunch on a hot May afternoon. 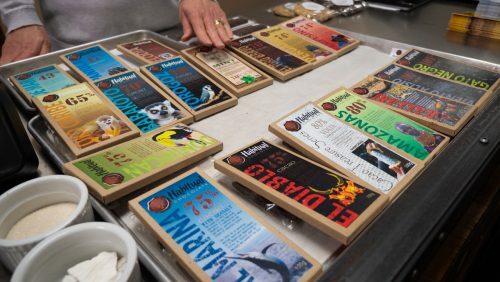 You can get other goodies made with local cheese like their famous mac ‘n’ cheese poppers made with Bright Cheese’s collection and a smoked Gouda burger from Mountainoak Cheese. Their cheesy menu is a hit with the locals and visitors as they were packed all afternoon! This is a great pub to check out with your friends if you are in the area. Sit back and relax with a nice cold beer. 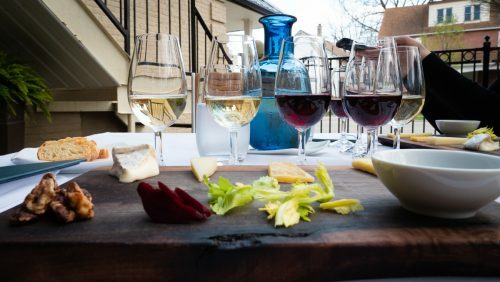 Even though most stops for Big Cheese Days are centred around food, there are some fun stops that will spare some calories. 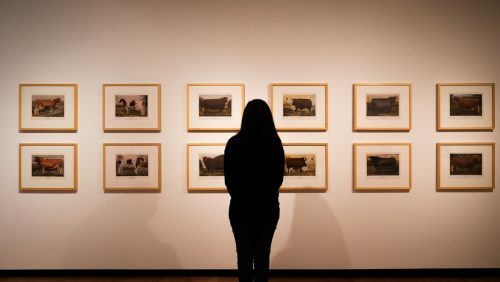 You can head over to the Woodstock Art Gallery and see some works of art from local artists. For Big Cheese Days, they have an exhibit from Ross Butler which showcases his true to life artwork on cows and you can see a video on his impressive butter art! (He sculpted the queen on a horse in butter!!!!) This is a nice relaxing stop during Big Cheese Days. Stop by and feel cultured, haha get it? 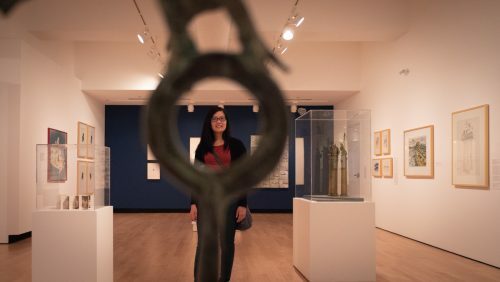 Cultured like cheese? Okay, I will stop now, haha! The next stop is truly special! I have actually heard so many great things about this restaurant and was so glad to stop by for a wine and cheese tasting. The place I am talking about is sixthirtynine. 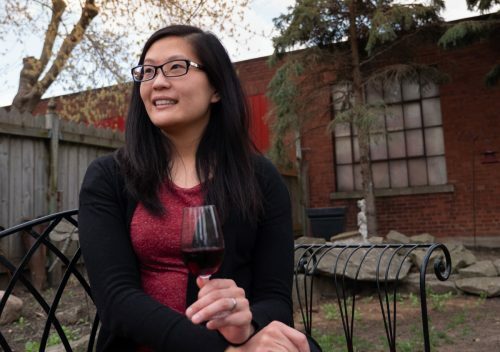 They are a casual fine dining restaurant with high quality foods that support local farmers. 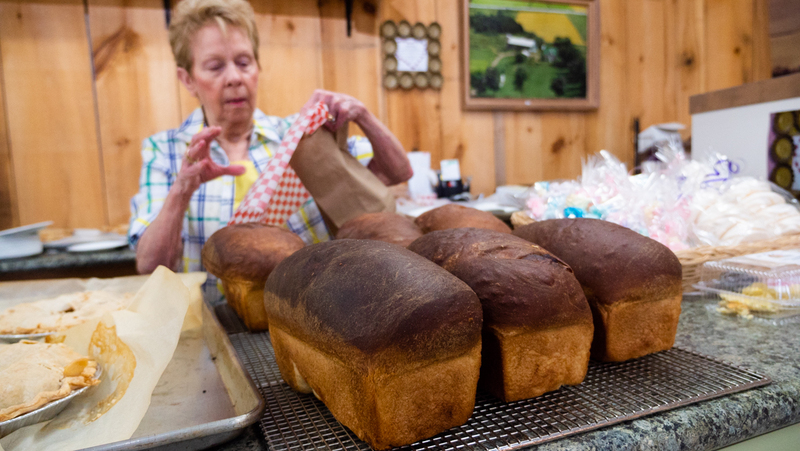 They are an Oxford County favourite and it’s no surprise they have been around for 13 years. We stepped into the beautiful restaurant and were immediately greeted by Chef Eric and his mother Pauline with the warmest welcome. They seated us outside to enjoy the beautiful weather. Shortly after, their sommelier Zach Lebert introduced himself and walked us through the tasting. Every piece of cheese and wine were hand selected and paired up superbly. They also created candied pecans, pickled beets, celery and a jam to go with the tasting. Everything was made fresh and from scratch including their pillowy soft bread. (I’m getting hungry just thinking about it). The atmosphere, level of service and quality of food makes this restaurant a 5/5 for me. 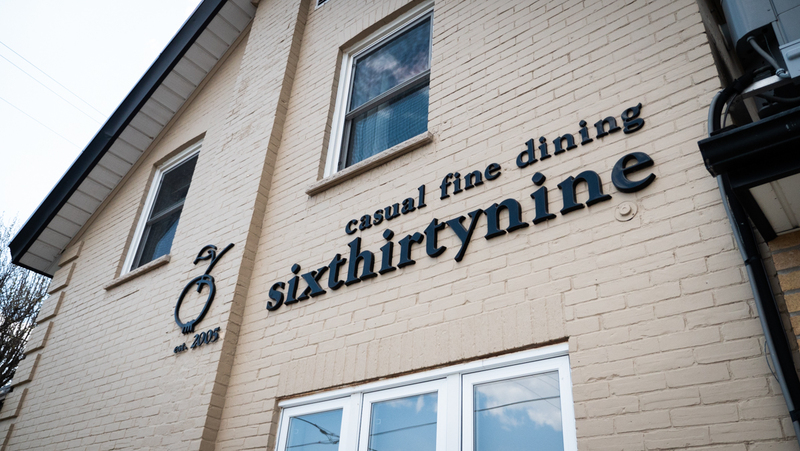 I completely understand why everyone in Oxford loves sixthirtynine. There are so many interesting and “Gouda” stops during Big Cheese Days in Oxford County. If you are a fan of culinary tourism and need a mini getaway, get out there and enjoy Big Cheese Days! You will thank me for it! Big Cheese days are running every Saturday from 10am-5pm in May. Check out all the fun and delicious things you can do here. Have you visited Oxford County before? What’s your favourite culinary tourism destination you have visited? Comment below and let me know!